GENT.- Design from the first decades following WW II is garnering great public interest. Commemoration exhibitions on Expo 58, the Brussels world fair, are abound. Before 1975, Design museum Gent did not possess any collection from the post-war period. Moreover, the museum was closed between 1958 and 1973. Thanks to interesting acquisitions and countless donations the museum can now pride itself on a valuable collection of design from the 50s and 60s. Due to lack of exhibition space, this collection has been temporarily stored away in the museum reserves. The collection is now brought out for this temporary exhibition. In the post-war period, Europe nurtured a great desire for security and a regulated life. The economy very quickly recovered mainly thanks to financial and material aid from the USA. In Europe, the USA also set the pace in the field of progress and fashion. Cars, refrigerators, television sets, washing machines and record players all fell within everyones budget and captured family life and leisure time. The results of research conducted during the war in the field of synthetic materials were now being used for civil purposes and used in everyday products such as nylon stockings, Tupperware products and seating. Synthetic materials such as polyester or polyamide were easy to colour, weighed little, were suitable for the replacement or imitation of other materials, and consequently were ideal for the industrial production of cheap consumer goods. Quickly altering fashion trends and the advent of disposable products went hand in hand with the rise of synthetic materials and created new challenges for the designer. In 1956, Italy saw the foundation of the first professional association for industrial design, the Associazione per il Designo Industriale (ADI). Pioneers such as Achille Castiglioni, Ettore Sottsass or Giò Ponti laid the foundations for the worldwide renown lavished upon Italian design, which was the pinnacle of creative, fanciful approach to design problems. Besides Italian designs, Scandinavian design was also coming to the fore. In simple and high-end furniture, designers such as Arne Jacobsen or Hans Wegner gave new meaning to the long-standing Scandinavian tradition of woodwork, and in this way they distinguished themselves from the numerous hectic and eclectic designs of the time. In Germany, a movement arose from the design academy which was founded in 1955 in Ulm; a movement which adhered to the strictly nationalist attitude laid out by Bauhaus. In cooperation with the Braun firm, the representatives of this movement also developed a so-called Corporate Identity, which was to comprise not only the product range, but also all aspects of a company, therefore including printing, showrooms and advertisement campaigns. The boom in the field of industry and trade echoed into the beginning of the 60s. Some European countries even saw a shortage of manpower calling for immigrant workers from southern Europe. The western industrial nations reached a stage of saturation as the majority of households had disposal of the main technical appliances. Still, demand was maintained by means of advertisements and products with limited life spans. Content and motives of consumer society became the object of art. While the representatives of Pop Art depicted food cans and advertisement symbols, and in doing so questioned the opposition between art and rivalry, pop bands such as the Beatles were hailed as idols by affluent adolescents. The initial successes in the field of space exploration conjured up visions of space travel, which were projected in film and fashion, but also in furniture designs. While growing criticism of the prevailing society reached its apex in student uprisings and the hippie movement, a change in furniture design became apparent as early as the beginning of the 60s. Besides a shift of ideas, the cause for this change was mainly due to the growing technical and design possibilities designers enjoyed. While some designers continued to strive for the exploitation of the economic advantages of synthetic materials, others also acknowledged the materials creative possibilities. The possibility to shape and colour synthetic materials almost at leisure led to a trend of organically rounded, transitionless shapes which seemed to be one-piece. 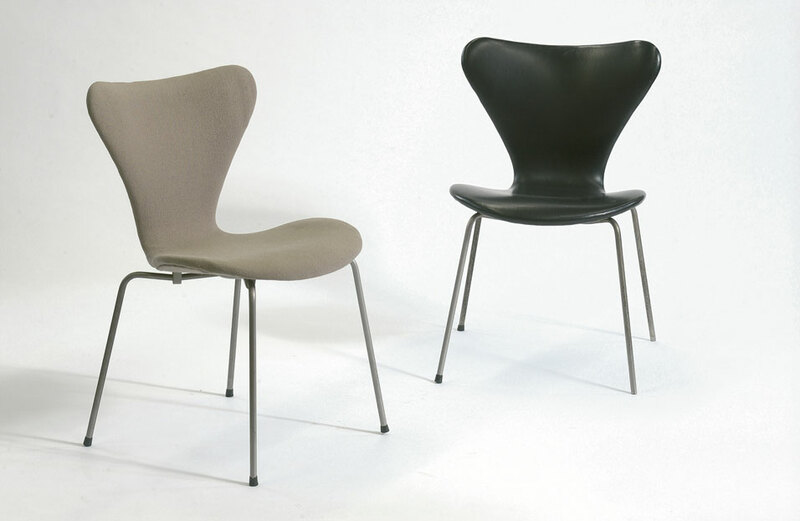 Dane Verner Panton was the first to succeed in creating a design for a chair which was shaped from a single piece of synthetic material. Among the most influential individuals was Joe Colombo who designed innovative mass-produced items with individual and consistent design and futuristic space themes. As of 1965, groups such as Studio 65 created a sensation with utopian architectural designs, experimental furniture designs and happenings. They wished to offer alternatives to strictly partitioned and determined spaces, alternatives to rationalist, right-angled architecture and furniture which limited and isolated the user. The communal living concept found its counterpart in colourful living landscapes which were composed of organically shaped upholstery elements and which sought to avoid inter-human demarcation. Sculptural and remarkable furniture pieces were fashioned out of polyurethane foam, which allowed for free, soft shapes to be made, and which was stable even without a supporting structure. The first inflatable furniture also turned heads by virtue of their humorous and novel aspects, and were attractive because of the unity of material and structure. At the same time came the advent of postmodernism, of which American architect Robert Venturi laid out the basic tenets in the 1966 publication Complexity and Contradiction in Architecture. Instead of consistently striving for innovation, a common feature in any modern movement, Venturi propagated eclecticism, which consciously treated available styles and traditions.